We ''Agescan International INC'', Canada based firm of tungsten and related products are offering a wide variety of Syringe Shield With Lead Glass Window 007-700. It has a flush mounted window of lead glass, which provides the protection and visibility. 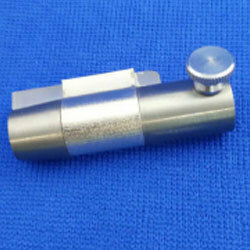 Tungsten of thickness 2mm is used to construct the barrel of the shield, which reduces the exposure of the radiation from Tc-99m by more than 99% attenuation for Tc-99 tested with TLD chips. This highly efficient Syringe Shield With Lead Glass Window 007-700 can be accessed by our prime customers. The barrel of the shield is constructed of 2 mm thick tungsten that will reduce radiation exposure from Tc-99m by more than 99% attenuation for Tc-99 tested with TLD chips.